While the work of Henri Lefebvre has become better known in the English-speaking world since the 1991 translation of his 1974 masterpiece, The Production of Space, his influence on the actual production of architecture and the city has been less pronounced. Although now widely read in schools of architecture, planning and urban design, Lefebvre’s message for practice remains elusive; inevitably so because the entry of his work into the Anglosphere has come with repression of the two most challenging aspects of his thinking: romanticism and Utopia, which simultaneously confront modernity while being progressive. Contemporary discomfort with romanticism and Utopia arguably obstructs the shift of Lefebvre’s thinking from being objects of theoretical interest into positions of actually influencing practices. Attempting to understand and act upon architecture and the city with Lefebvre but without Utopia and romanticism risks muting the impact of his ideas. Although Utopia may seem to have no place in the present, Lefebvre reveals this as little more than a self-serving affirmation that ‘there is no alternative’ to social and political detachment. Demanding the impossible may end in failure but as Lefebvre shows us, doing so is the first step towards other possibilities. To think with Lefebvre is to think about Utopia, doing so makes contact with what is most enduring about his project for the city and its inhabitants, and with what is most radical about it as well. 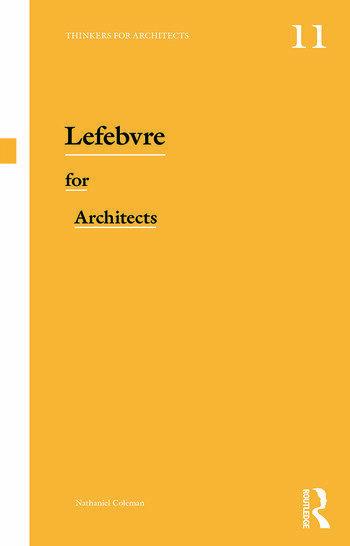 Lefebvre for Architects offers a concise account of the relevance of Henri Lefebvre’s writing for the theory and practice of architecture, planning and urban design. This book is accessible for students and practitioners who wish to fully engage with the design possibilities offered by Lefebvre’s philosophy. Nathaniel Coleman is Reader in History and Theory of Architecture at Newcastle University, UK. He previously taught in the US, and practiced architecture in New York, USA, and Rome, Italy. Author of Utopias and Architecture (2005) and editor of Imagining and Making the World: Reconsidering architecture and Utopia (2011), Nathaniel recently guest-edited a special issue on architecture of the journal Utopian Studies (2014). He has published numerous journal articles and book chapters, and presented his research on the problem of architecture and Utopia internationally. He is particularly interested in the convergences of architectural history, theory and design with Utopia’s generative potential.